The Maine Beaches Conference July 12 will explore the lessons that Maine can learn from last year's superstorm Sandy, in which the surge brought the most destruction. 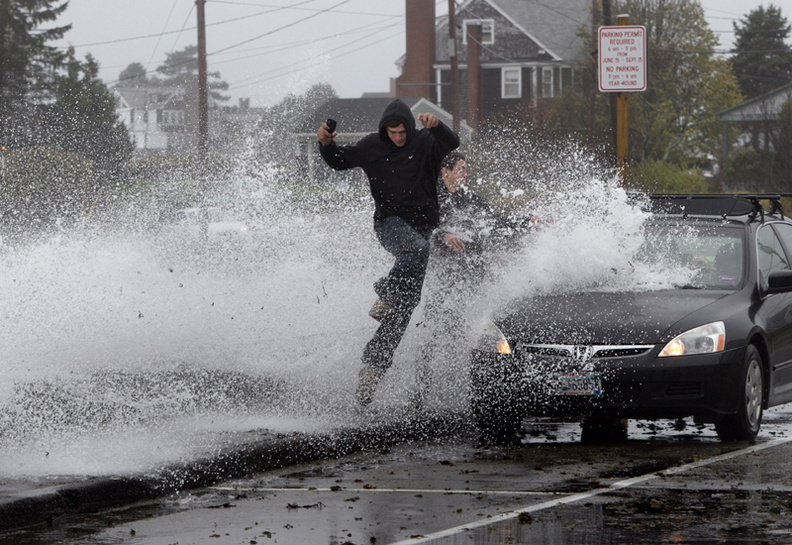 PORTLAND — When the biggest of storms strikes the Maine coast, it won’t be high wind that causes the most damage. It’ll be the storm surge. Much of the destruction from superstorm Sandy last fall was caused by the storm’s surge, when rising seawater pushed by powerful winds came ashore and brought widespread flooding and damage to New York and New Jersey. Sandy’s impact and the lessons Maine can learn from the storm will be a focus of next week’s 2013 Maine Beaches Conference. The highest storm tide — the combination of tide level and storm surge — in Portland was recorded during the blizzard of 1978, said Stephen Dickson, a marine geologist with the Maine Geological Survey who will speak at the conference. On Feb. 7, 1978, a 2.5-foot storm surge combined with an 11.6-foot tide resulted in a total storm tide of 14.1 feet, he said. But geologists recently learned that there have been storm surges of 4, 5 and 6 feet through the decades in Portland, according to tide gauge records going back to 1912. The highest storm surge on record was 6.5 feet, on Jan. 24, 1921, but that occurred during low tide so its impact was minimal. “If we had a surge like that at high tide, we would have waters where we never had them before. And then we would have our own Sandy,” Dickson said. The 2013 Maine Beaches Conference is being held July 12 at Southern Maine Community College in South Portland. As many as 200 coastal property owners, recreational beach users, volunteer beach monitors, scientists, public officials and others are attending, said Kristin Grant of the Maine Sea Grant program, which coordinates the conference. The daylong symposium features sessions on tourism, erosion control, pollution and other beach-related topics, with the opening session focusing on Sandy. Sandy was so destructive because it made landfall at high tide, resulting in 500-year storm tide levels in some places, said Jay Tanksi, a coastal geologist with the New York Sea Grant program who is speaking at the conference. The waters flooded 90,000 structures and damaged some 25,000 vehicles beyond repair, he said. Toxins were released from heating oil tanks in flooded basements, and hundreds of thousands of tons of debris had to be removed. A storm with an extreme storm surge wouldn’t be as destructive in Maine, simply because Maine is less developed than New York and New Jersey. Still, it would damage and destroy coastal homes, piers and docks, lobster pounds and countless boats. While much is made of the destructive power of hurricanes, it’s the nor’easters — storms that move north with wind blowing from the northeast — that pose a bigger threat to Maine. Only one hurricane in the past 100 years — Hurricane Carol in 1954 — has brought coastal flooding to Maine, but numerous nor’easters have, said John Cannon, a meteorologist with the National Weather Service who is also speaking at the conference. Nor’easters pose a danger because they are slow-moving and large and can last through multiple tide cycles, Cannon said. The worst destruction will come from a nor’easter with a strong storm surge that hits the coast during an astronomical high tide, he said. “We had a storm come in March 2010 that had an incredible storm surge,” he said. “It happened in the middle of the night and it happened at low tide, so people went to bed and woke up the next morning and everything was fine.